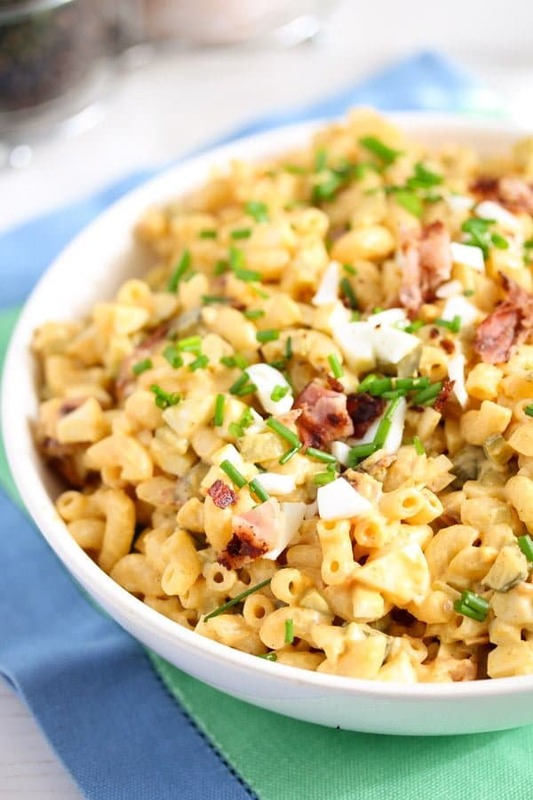 Simple and creamy deviled egg macaroni or pasta recipe with bacon, Dijon mustard, mayonnaise and gherkins, a wonderful way of using some of those leftover hard boiled eggs from Easter. What is a potluck get together without at least 2 or 3 pasta salads? Is it even possible to have such an event without a pasta salad? Not in Germany anyway. To tell you the truth, I have never even heard of a pasta or macaroni salad during my childhood and teenage years in Romania. The only two ways we ever had pasta were in form of The Easiest Skillet Macaroni and Cheese or in form of overcooked, pretty bleh spaghetti, which my grandmother would cook maybe once every two years as a side dish for the Easy Hungarian Chicken Paprikash (With Dumplings) – without dumplings in this case. But nowadays, there is a pasta salad here, a pasta salad there, I have tried dozens of versions during the last years and I liked most of them. There is something suiting, comforting about a good pasta salad, the creamy dressing, the different ingredients that you can add to it. It is easy to make, most of the time cheap as well, you can easily make it in large quantities for a bigger gathering and it keeps quite well, so there is no stress if you have made too much of it, you can definitely enjoy it after a day or two as well. 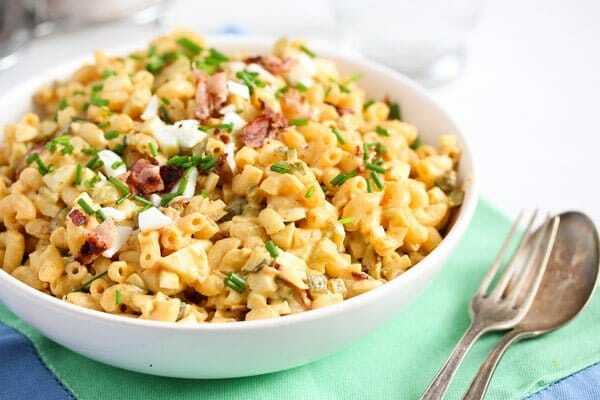 If you have a good and easy pasta salad recipe, you need not worry anymore about what to bring to any kind of potluck get together, if you have brought such a salad as this Creamy Deviled Egg Pasta Salad with Bacon – Eggs Recipes once, you can be sure that people will ask for it again and again. I came up with this recipe as another way of dealing with leftover hard boiled eggs. I made it for the first time around Christmas actually, I had cooked too many eggs for a chopped salad platter and I was left with too many already chopped eggs that had to be consumed immediately. First I thought about making the Romanian Boeuf Salad with Potatoes, Gherkins and Mayonnaise, but then we have had so many potatoes already, I needed something else. So I thought a pasta salad with eggs would definitely be delicious. And it was! My first version was very basic and quite similar to the above mentioned Boeuf Salad. I used macaroni instead of potatoes, I left out the carrots, pickled red peppers and chicken and made the pasta salad with mayonnaise, gherkins and olives. This time I used more eggs, less mayonnaise for the dressing and enriched the salad with some delicious hearty bacon. So good, so creamy, so comforting, you should definitely give it a try. 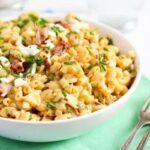 As mentioned above I used leftover hard boiled eggs to make this Creamy Deviled Egg Pasta Salad with Bacon – Eggs Recipes. However, you can boil some eggs, if you don’t happen to have any leftovers. Give the eggs to a saucepan, cover well with water and bring to a boil. Remove from the heat and let stand, covered, for 13 minutes. Drain and give to a bowl of iced water. Let stand for about 5 minutes. Peel the eggs. Let them cool down while you prepare the rest. I like to use either German medium mustard or French Dijon mustard for any kind of dressings. 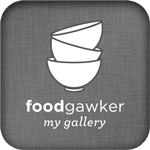 But you can vary the sort of mustard you use, you can take some hot English mustard (just be careful in this case, too much English mustard would ruin the dressing) or you can use some sweeter grainier sort of mustard. If using a sweet mustard, adjust the taste of the salad with a little vinegar. Also the amount of mustard you add is a matter of taste, you can add more for a stronger mustard taste or less for a milder dressing. The tastiest mayonnaise I know is homemade mayonnaise. I use that most of the times when making salads, however, not when bringing the salads to a party. In this case, the salads spend a long time on the table and I feel it is not safe to keep fresh mayonnaise outside the fridge for a longer time. We like sweet and sour dill and mustard seed gherkins in this and in many other salads. You can use them or any other (dill) pickles you happen to like. I usually prefer sweet paprika to any other kind of paprika, but in this case a touch of smoked paprika gives the salad a very special flavor, so do use it, if available. 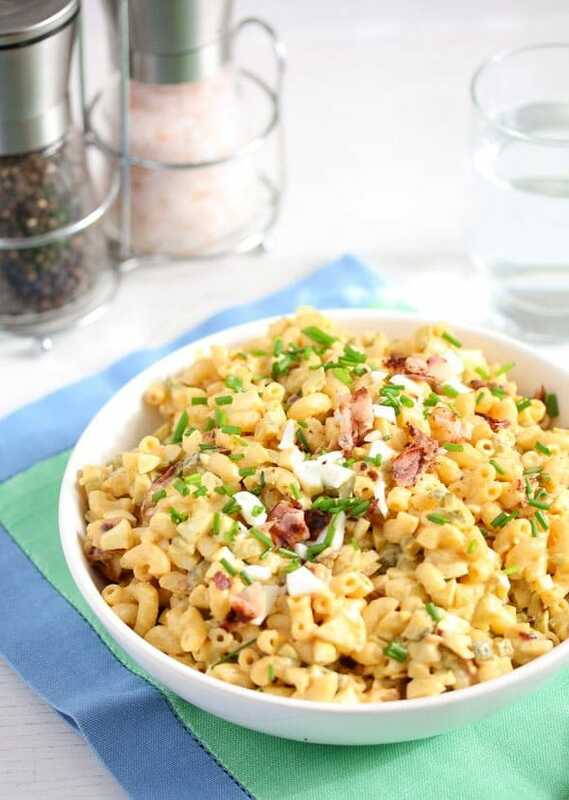 I used a small onion for this macaroni salad, but more often I like to use finely chopped green onions. 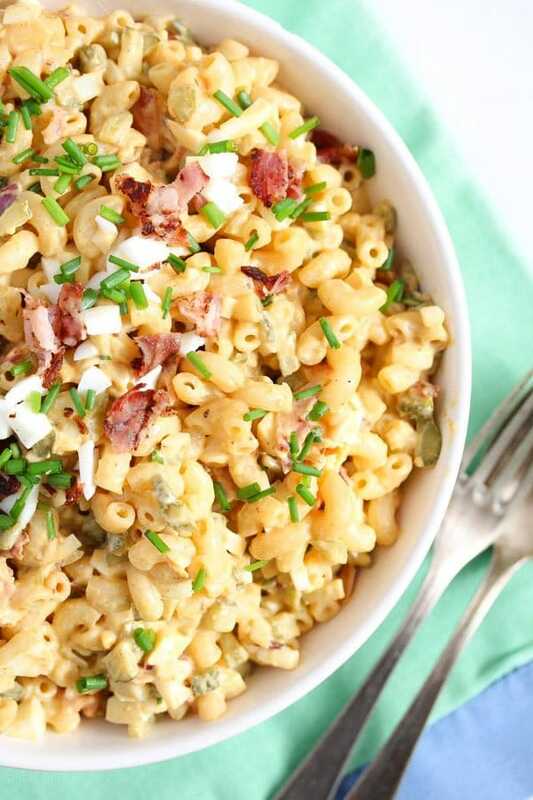 If you would like to make a vegetarian version of this Creamy Deviled Egg Pasta Salad with Bacon – Eggs Recipes, leave out the bacon or replace it with chopped olives, more herbs, finely cubed Gouda or cheddar cheese or/and roasted peppers. Bring a large pot of water to a boil, add salt and cook the macaroni according to the packet's instructions. Drain well and let cool slightly while you prepare the rest. In the meantime, halve the hard boiled eggs and remove their yolk. Give the yolks to a salad bowl and mash them with a fork. Add the mustard, mayonnaise, paprika, cayenne pepper and some salt and pepper. 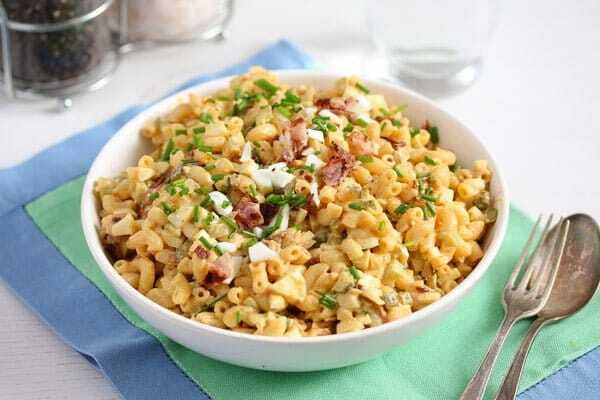 Mix very well, then add the pasta to the bowl and mix well again to coat the macaroni with the dressing. Heat a large pan and fry the bacon slices until crispy. Place them on kitchen paper to remove the excess fat. Chop the bacon into small pieces and give them to the bowl. Finely chop the egg whites, gherkins, onion and chives and give them to the salad as well. Mix well and add more salt and pepper to taste. Can’t remember when I last time had some REAL pasta! This look creamy, satisfying and moreish…a perfect spring dish, Adina. This pasta is right up my alley! 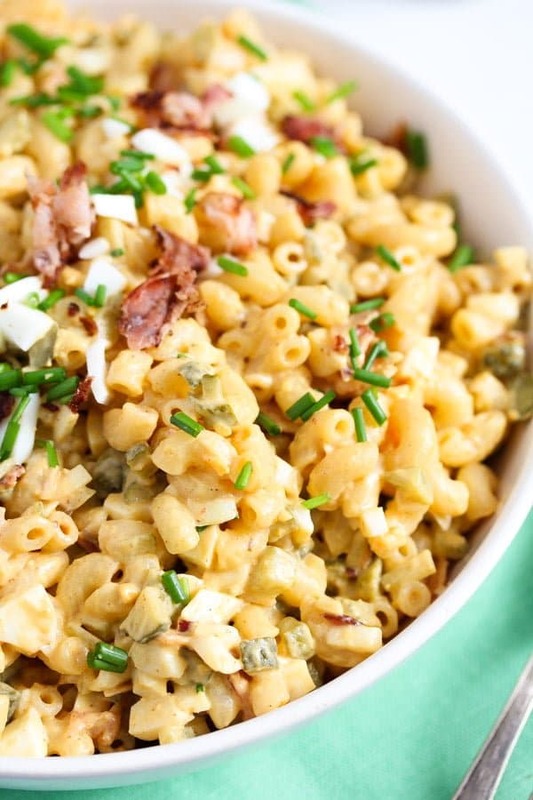 You’e so right, this would be perfect for a potluck. But I’m not waiting for a potluck to make it. I’m adding extra eggs to the shopping list this weekend!